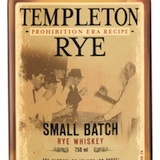 Here’s a late addition to my two–part StogieGuys.com A-Z Guide to Rye Whiskey: Templeton Rye. Templeton, like many ryes on the market, is distilled at the the Indiana distillery formerly known as LDI, now known as MGPI (it’s also their stock ticker). But as we’ve explored in our series on rye, just because the rye has the same source doesn’t mean it tastes the same. Templeton, bottled in Templeton, Iowa, at 80-proof, sells for around $40 a bottle. Templeton was one of the first to tap into the LDI rye, and for a while it was a bit of a mystery where the rye was made. A marketing story about being made from the recipe that was preferred by Al Capone got the brand in a bit of hot water, but it has since taken steps to clarify that, while inspired by an Iowa-made whiskey enjoyed by Al Capone, the current product is distilled in Indiana. Controversy aside, what’s most important is how the whiskey tastes. And this one tastes good. The color is a light caramel and the nose is an inviting combination of sweetness, tropical fruit, and spice. Think bananas foster with lots and lots of cinnamon. On the palate, Templeton has a lush mouthfeel. It features toffee, wintergreen, dates, and a little oak. The finish is clean with a minty element. It definitely shares the basic profile of most LDI ryes, but each takes on its own character. For Templeton, I was somewhat surprised at the intensity it keeps, despite being bottled at only 80-proof, the lowest proof a straight rye can legally be. The combination of sweetness and spice screams out for a Cameroon-wrapped cigar. My three favorites right now in that category are the Fuente Hemingway, La Flor Dominicana Cameroon Cabinet, and the Nirvana by Drew Estate. With so many excellent ryes out there, including so many from the same distillery source, it’s hard to recommend one over the other. All of them are tasty, and each has its own distinct character. Templeton, while a few bucks more than some of the others, is worth checking out. Rye fans will each have their own preferences, but I wouldn’t hesitate to recommend picking up a bottle of Templeton to decide for yourself. My understanding is MPGI uses the same mashbill of rye to supply Bulleit, Templeton, Filibuster, High West, James E. Pepper, Redemption, and Smooth Ambler. Based on this, and since some of these cost more than others, which do you think offers the best value? Also, do you know if the Lawrenceberg, IN distillery does tours? It's really a matter of personal preference so keep in mind this is just my take… but for me the best value is Bulleit with Redemption runner up (both under $30). At a slightly higher price point ($40) I'm a fan of Smooth Ambler 7 year rye. My favorite is Willett Single Barrel 4 year cask strength (green wax top, as opposed to the foil of their new two year) at $45, but that's increasingly very difficult to find. High West is good, but it's not quite apples-to-apples since they blend young LDI rye with older rye from somewhere else that they acquired. As for MPGI, my understanding is no tours and it's far more industrial than many of the picturesque distilleries on the Kentucky bourbon trail.